The application process has been summarized into 6 steps, which document how you will progress through the application forms to the Workplan and concluding with the Funding Agreement. Throughout the process you will be guided by the FPSC. Be sure to regularly check your email to receive email prompts from the Registrar! Here is the application process chart. Review the Post-Farm Food Safety and Traceability Program website, alongside the Program Guide, for information about the program – and decide if this program is right for your company. If so, click here To Apply. 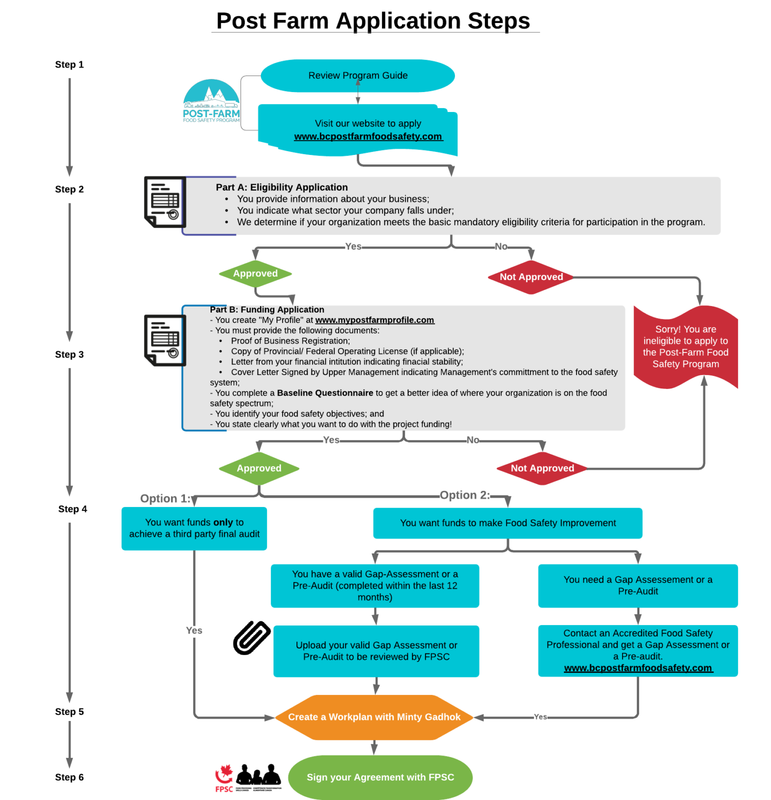 The Post-Farm Program has a two-part online application process, Part A and Part B. In this step, we’ll start by completing the first half of the application process, which is Part A. Part A- Eligibility Application (1 of 2): This section of the application captures some preliminary information about your business, indicates what sector your company falls under, and determines if your organization meets basic mandatory eligibility criteria for participation in the program. At this stage, you will also be creating your login credentials (email and a password) for your online “My Profile” that will be used throughout the duration of the program. Start your application and filling out the Part A form, under “Apply Now”. You may request a paper- based application process by contacting the program Registrar. Upon approval: You will receive an email notification from the Registrar inviting you to fill out the second part of the application process. All applicants must meet all program eligibility criteria before they are approved to continue with Part B.
Congratulations on making it to the second part of the application process, your company has successfully met all the mandatory eligibility criteria for participation in the program! Upon approval of your Part A application, you will receive an email notification from the Registrar inviting you to fill out Part B of the application process. Part B- Funding Application (2 of 2): In this section, applicants are required to provide supporting documents to confirm that they are businesses operating and filing taxes in the Province of BC. The primary purpose of Part B is to get a better idea of where your organization is on the food safety and traceability spectrum – to do this, each applicant fills out the “Baseline Questionnaire” which lets us know what systems you currently have in place. Most importantly, in this part we will be briefly asking you what you would like to do with the project funding! A cover letter signed by upper management indicating Management’s commitment to food safety and improving food safety systems. Fill out the Part B application by signing in to your online “My Profile” account using the email and password that you created in Part A. The email from the Registrar inviting you to complete Part B, will include a link to the My Profile login page, but you can always find the sign in on our main project website. Step 4: Choose your placement! Once your application is approved, you will need to choose the option that reflects your case. Note: Gap-Assessments or Pre-Audits identify and document food-safety risks or lapses in your facility. Gap-assessments are required for all participants seeking funds for food safety improvements. The PFFS Program requires that a fresh gap assessment be done. The requested food safety activities are identified in the submitted document (e.g. non-conformances not yet addressed). If applying for HACCP certification only, and not any food safety improvements, you are not required to submit a PFFS valid form of assessment. What is a Workplan? In the Post- Farm Program, a “Workplan” is a form that documents all activities that you are seeking cost-sharing funding for. The Workplan spreadsheet identifies the cost of each proposed activity – outlining your financial contribution, and the amount that the program Registrar will reimburse with project funding. Your Workplan is a very important document, it will follow you throughout the duration of the program. How do I make my Workplan? Schedule a time to speak with our Technical Program Advisor (TPA), Manmohan Singh (Minty) Gadhok, who is an industry expert that is well-versed in the eligible project expenses. The TPA will review your application forms and suggest a recommended course of action, in conjunction with the program funding available. Together, you will work with the TPA to put together a workplan that is a suitable for your company’s operations. You may be required to seek quotes for this step. Finalizing your Workplan: Once you are satisfied with your Workplan and give the TPA the ‘green light’, your Workplan will be sent to FPSC to approve and start your contract! At this stage your workplan has been finalized and is ready to be made into a contractual Funding Agreement. The program Registrar will develop your contract, based on the Workplan submitted. You will sign and submit your contract through “My Profile” account. Congratulation, you can start your project.